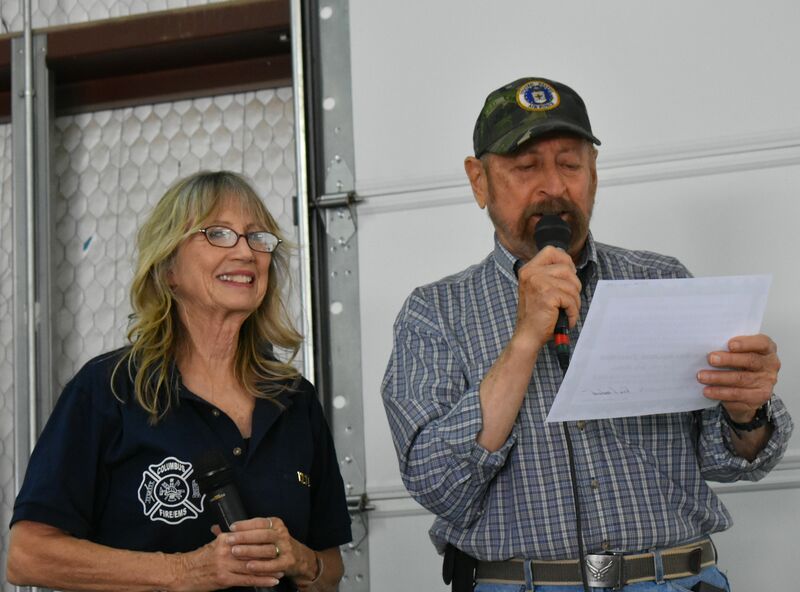 Long time Editor of the First Aero’s Aerodrome Newsletter, July McClure, (at left) made two home runs yesterday at the Columbus Fire Department’s Annual Open House event. The two awards caught July by complete surprise, which made the recognition that much more special. Fire Chief, Andres Ramos (at right), presented July with a special award in appreciation of her continuous thirty-three (33!) 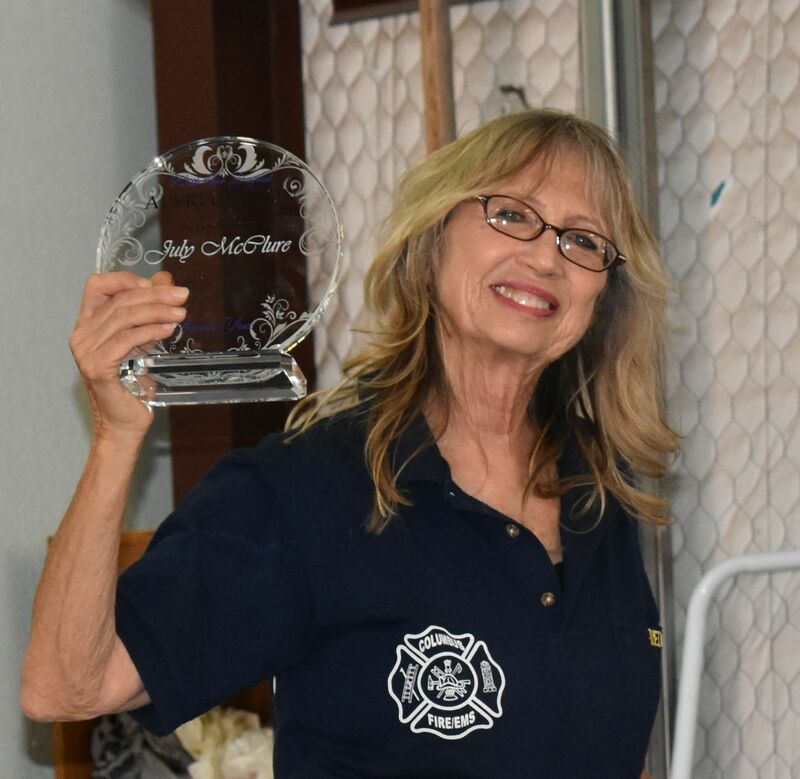 years of volunteer service with the Fire Department and community of Columbus, New Mexico. 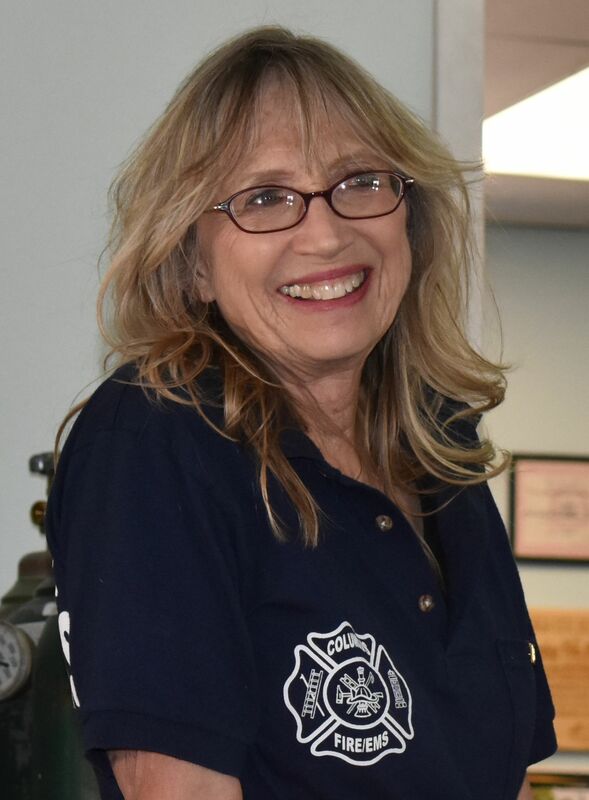 July is a Captain in the Columbus Fire Department. The Fire Department facilities are just West of the historic 1916 First Aero Squadron Airfield. 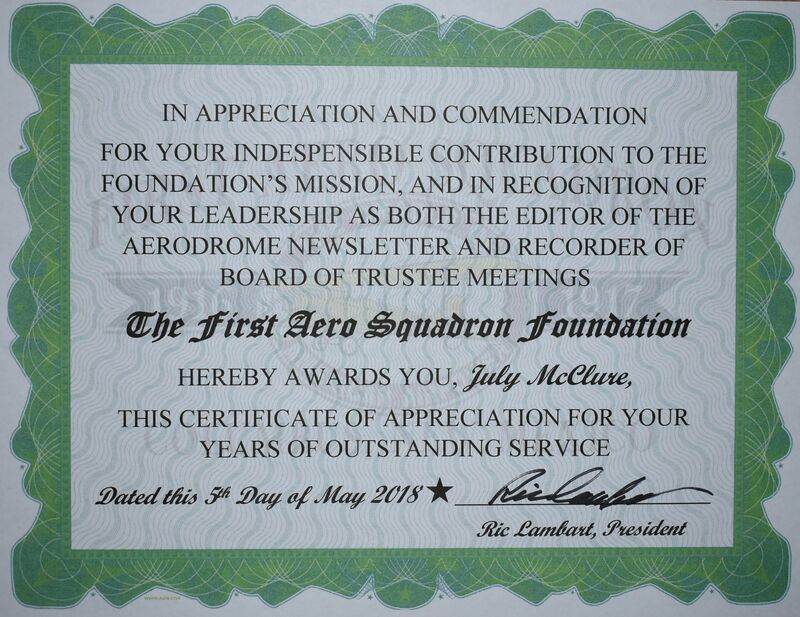 Next it was the FASF’s turn, as this writer had the honor and privilege of presenting July with a special FASF Recognition (for volunteer service) Certificate of Appreciation for her years of work as both the Editor-in-Chief of the Aerodrome Newsletter, and for her role as official Recorder of Board of Trustee Meetings, not to mention her hours of work at various public events helping the FASF staff its exhibition booths. July is a woman of diverse talents, one with which Columbus has been blessed for well over thirty-five years. Born in Washington, DC, of parents who were both professional musicians, and whose Dad, Jimmy, was also a US Naval Aviator, she was then was raised in Colorado, where she went on to obtain her Bachelor’s Degree in Cultural Anthropology. But the call of entertainment was too strong, and she quickly joined a cross-country touring orchestra as both an instrumentalist and vocalist, which included a gig in a West Coast radio comedy show. 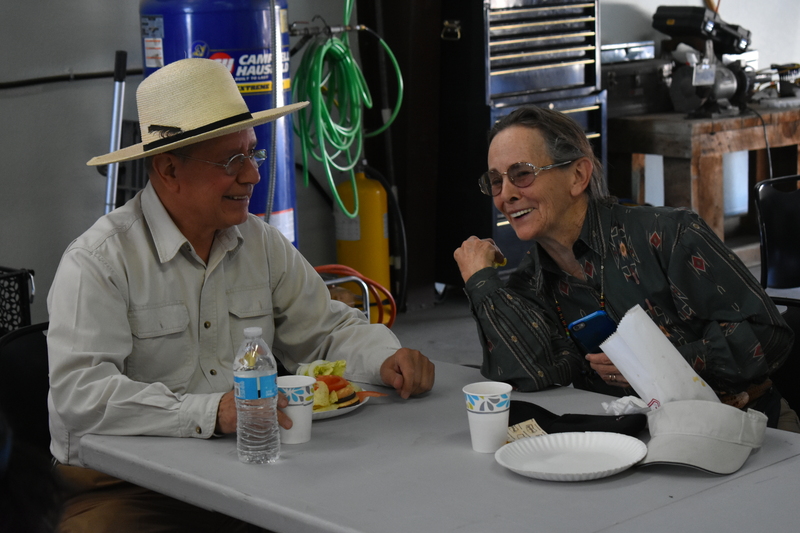 When she later married, and moved to Columbus, her profession changed to that of a Journalist, where she ended up working as a full time staff reporter for both the Deming Headlight Newspaper and the Desert Winds Magazine. However, Ms. McClure never lost either her interest in acting – or music – continuing her second career as an actor, appearing at least once almost every year in various theatrical productions. July also owns the esteemed Tumbleweed Theater in downtown Columbus, and regularly performs as a musician across SW New Mexico, most often as a member of the Spring Canyon band, which features Dev Olliver of Columbus and Paul Smith of Deming..
She often joins up with other local entertainers such as Bud and Jeane Canfield (Bud is one of the First Aero Advisors) and Deborah (“Dev”) Olliver, who’s photos of July from yesterday appear below. Dev, herself, is in another of yesterday’s photos, seen chatting with Columbus’ new Mayor, Bruce D’Salas. 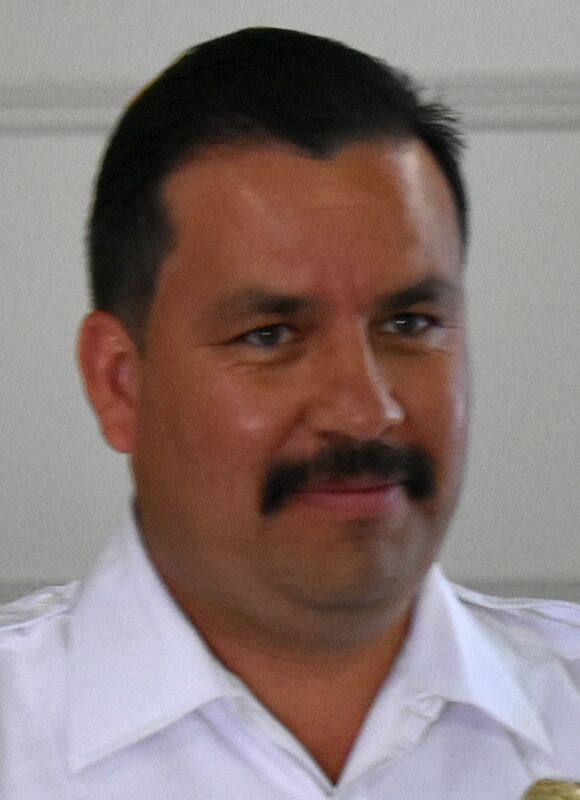 July has also served a number of times as an elected member of the Columbus City Council and consistently remains active in area politics. 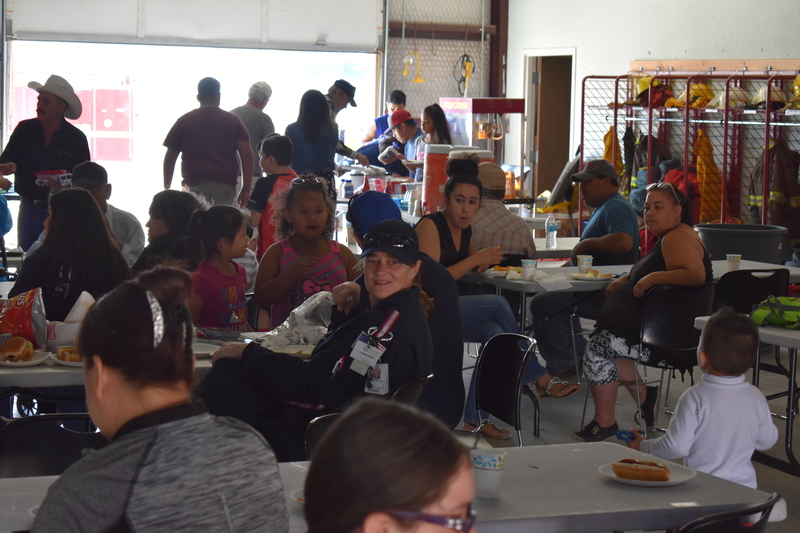 The following photos depict yesterday’s Open House Events at the Columbus Fire Station facilities. 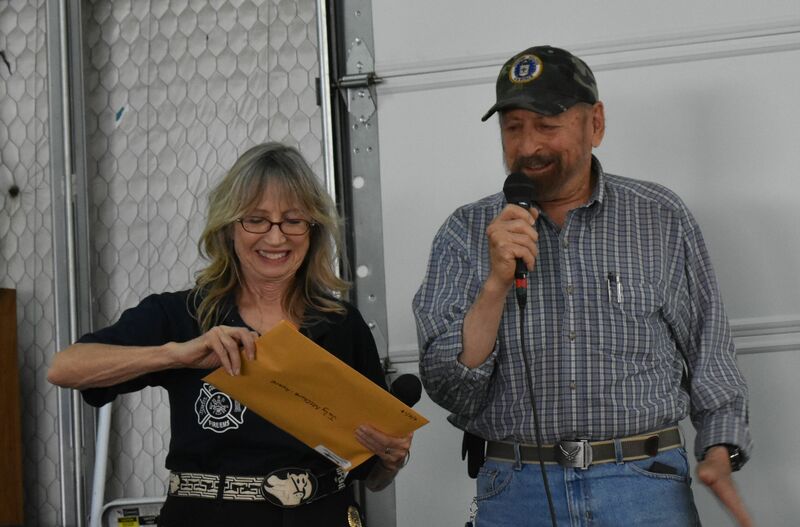 July, as left, opens her FASF Achievement Award as Ric Lambart looks on. Ric reads the Award’s Inscription to the audience as July looks on. 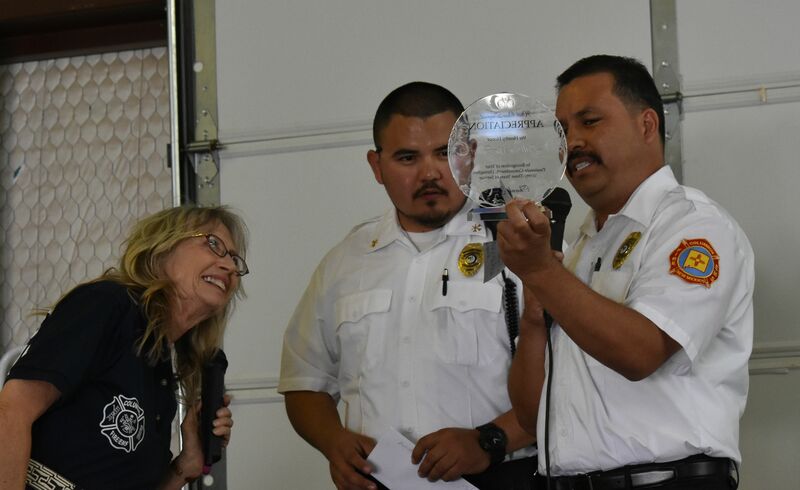 L to R above: Captain July McClure, trying to read the Fire Department’s Award Inscription as Former Fire Chief, Pablo Montoya, looks on and Presenter, Fire Chief Andres Ramos, reads the Award’s text to the crowd. Captain McClure proudly shows the Award to the audience. 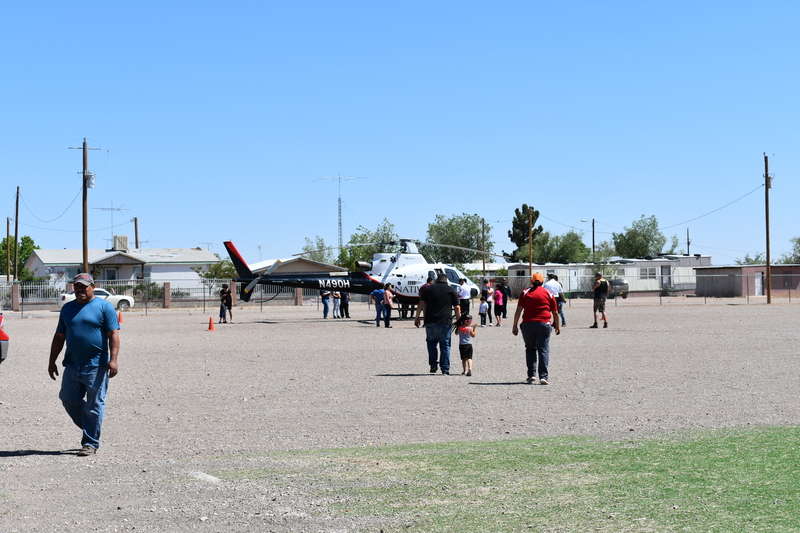 The Emergency Air Ambulance Helicopter landed on the City Baseball Field across from the Fire Station so the public could tour it up close. 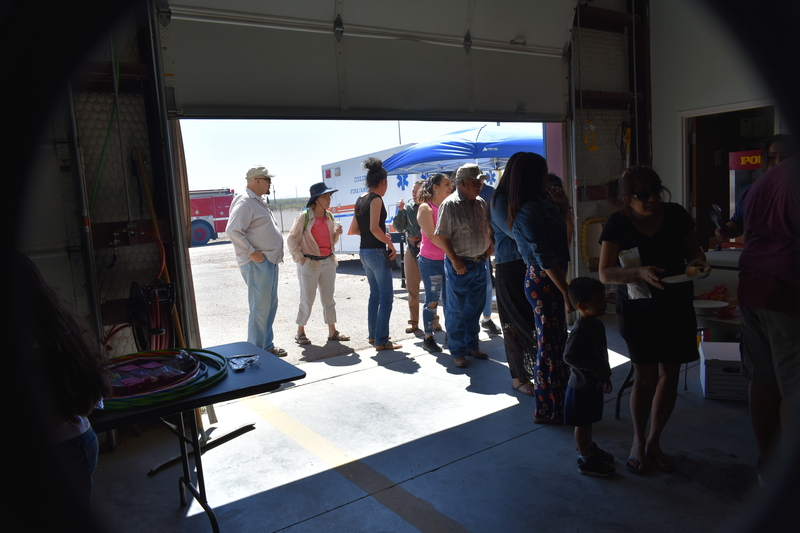 View of one of entrances to the Fire Station – Below the Blue Canopy seen through the doorway, is where some of the volunteer Fire Fighters worked over the grill to prepare the event’s barbeque main course. 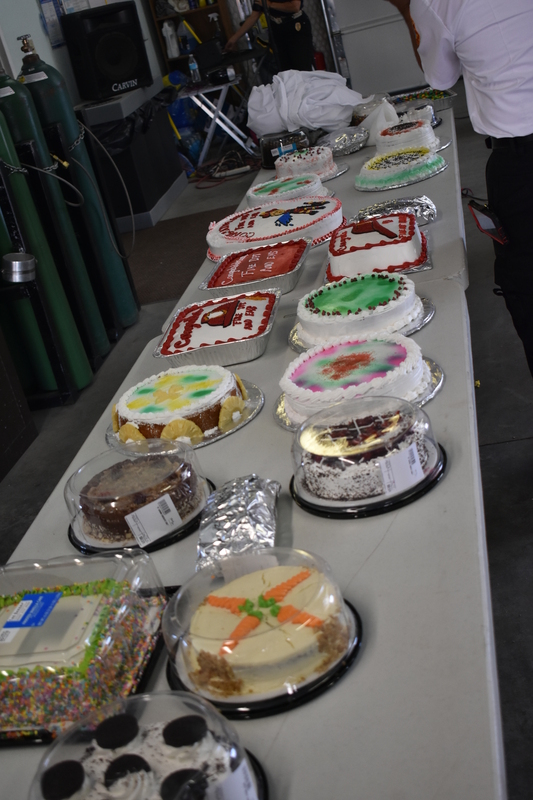 View of some of the many pies and cakes prepared by the public, which were auctioned off to the highest bidders as a way to raise money for the Fire Fighters. 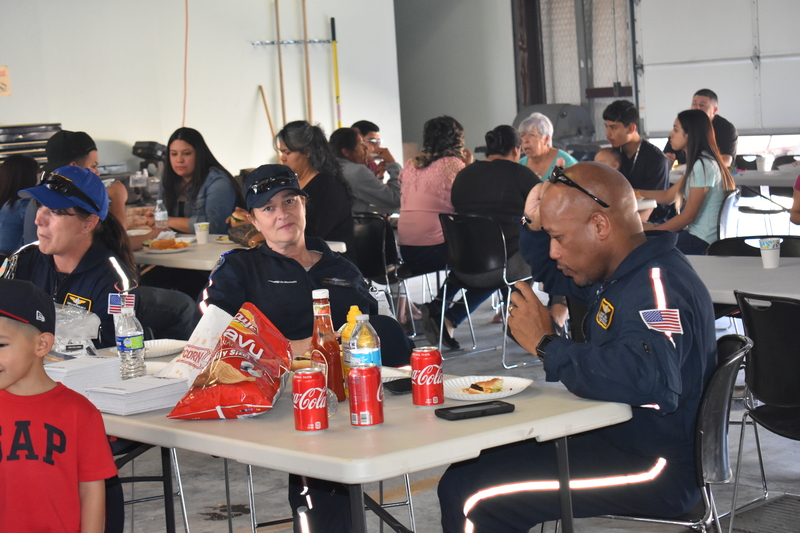 The Emergency Native Air Ambulance flight Crew enjoys the event’s food: At left is Teresa Nystrom, Flight Paramedic; center is Billi McNary, Flight Nurse, and the Helicopter’s Pilot, Manny Garcia, is at right. 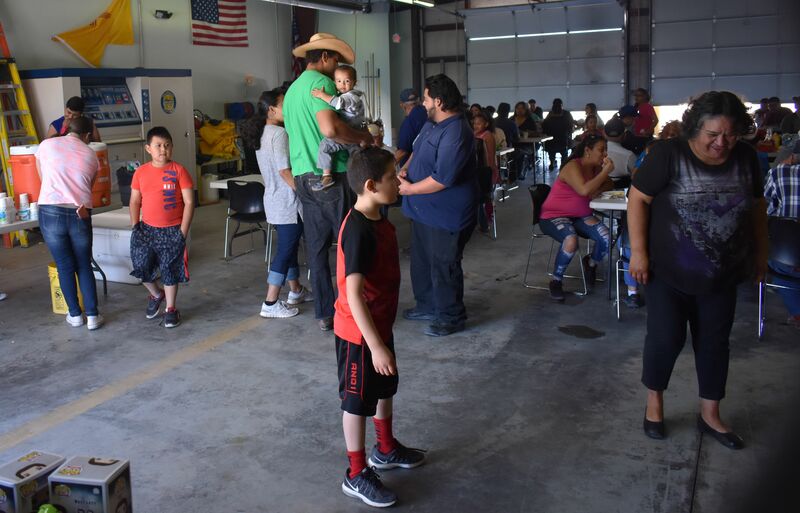 Their Air Ambulance Helicopter is stationed at the Deming Airport. 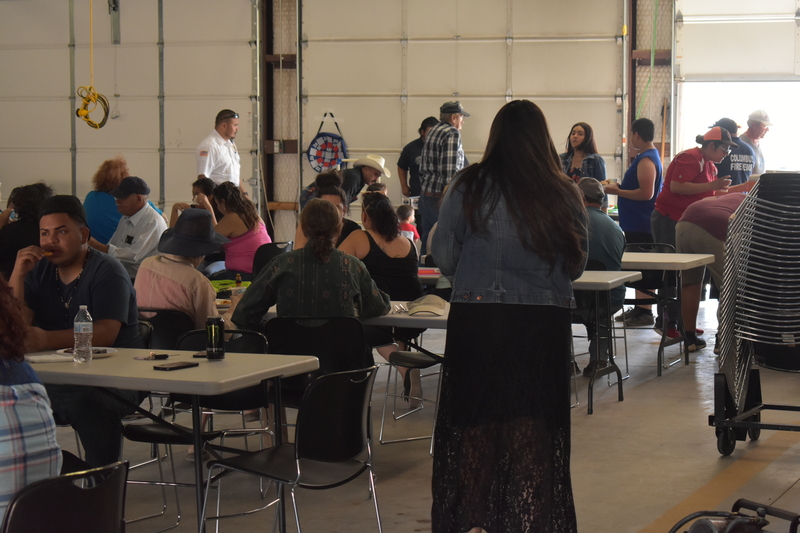 Their presence at the Volunteer festivities was courtesy of NATIVE AIR AMBULANCE, an AIR METHODS COMPANY. Part of the crowd of visitors. More of the guests enjoy their meals. Additional visitors arrive and search for dining table space. L to R: New Columbus Mayor, Bruce D’Salas chats with FASF Photographer, Dev Olliver. 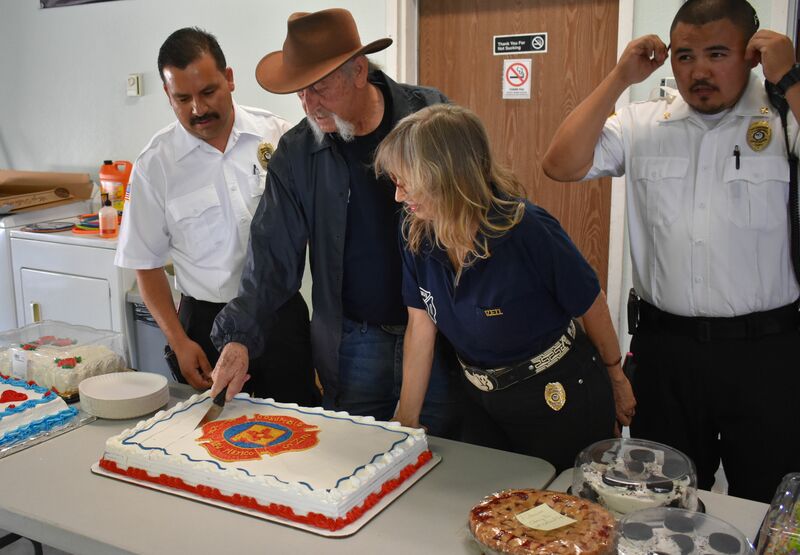 L to R above: Chief Ramos watches as Battalian Chief, Walter Simpson (who also received a Service Award), cuts into the Fire Department Cake, and Captain McClure and Assistant Fire Chief, Pablo Montoya, also look on. This entry was posted in HOT NEWS! and tagged Actor, Air Methods Company, Annual Open House, Battalian Chief Walter Simpson, Billi McNary, Capt. July McClure, Chief Andres Ramos, Columbus Fire Department, Columbus NM, CVFD, Deming Headlight, Desert Winds, Emergency Air Rescue Crew, Emergency Helicopter, Former Fire Chief, July McClure Actress-Vocalist-Musician, Manny Garcia, Musician, Native Air Ambulance, Pablo Montoya, Paul Smith, Radio Comedy Show, Ric Lambart, Spring Canyon Band, Teresa Nystrom, Thesbian, Tumbleweed Theater, Vocalist on May 6, 2018 by FASFRIC.